The Mexican artist Heragraff, whose real name is Jaqueline, has been around the art scene since 2007. 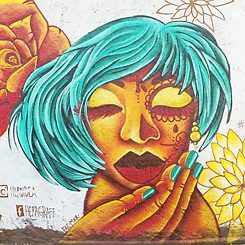 With her street art, she draws attention to the problems women experience in Latin America. In "No Más Violencia," she portrayed a woman with Latin American facial features. 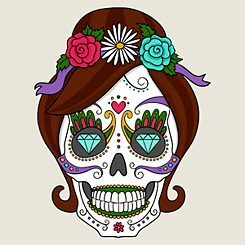 While she designed one half of her face neutrally, Heragraff uses the painted half to recall Catrina, a symbol of Mexican culture, but also of death. "So I am not saying explicitly that she is a dead woman, but if the violence continues, she will of course not be a normal woman next year, she will be a Catrina on the altar of her family," explains Heragraff. As part of this campaign, the Mexican artist Heragraff, on the initiative of the Museo del Juguete Antiguo México ("Antique Toy Museum Mexico", MUJAM for short, #StreetArtMujam), together with 12 other women, painted a wall in the Doctores district of Mexico City. ("Smart Skeleton" or "Elegant Skull") or Catrina La Calavera Garbancera is a zinc etching of the Mexican printer, cartoon illustrator and lithographer José Guadalupe Posada from 1910-1913, offered as a satirical portrait of those Native Mexicans who, like Posada, felt in the pre-revolutionary phase that they were striving to adopt European aristocratic traditions. La Catrina has become an icon of the Mexican Día de Muertos (Day of the Dead).